I’m delighted that the above linked clip gives us a look at a fresh faced 22 year old Jackie Moore debuting her fiery first single for Shout records in 1968. Although it would take her 2 more years to chart with her classic “Precious, Precious” all of the goodies for one of the finest voices in Florida Soul to take off into orbit where there from the beginning. 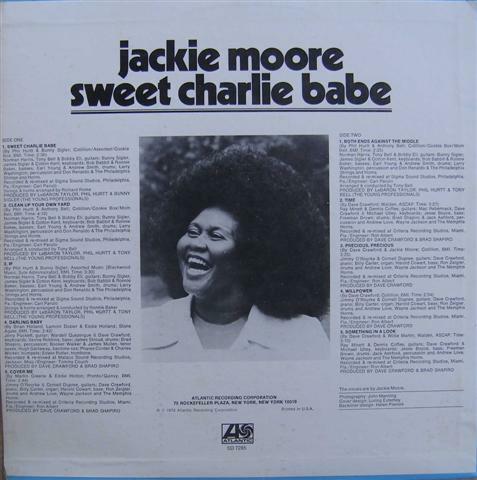 Although not well known outside of soul circles, she did spend a healthy part of the 1970’s charting on the R&B listings. The effortless purity and richness in her voice were plenty for Atlantic and Columbia to keep her recording through the early 1980s. Her debut, a pretty explicit “Dear John” letter could have come off as remarkably trite in less skilled hands, but Jackie finds every pocket of emotion possible with the song. It’s definitely an unheralded soul classic, and here’s to it making your Wednesday in May a little more smile worthy.